Credit (or as we like to call it “attribution”) is always noted on the Leader Detail Screen. 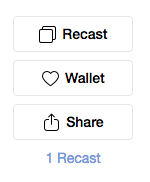 If you see a link below the Recast, Favorite and Share buttons that says something like “1 Recast”, that means that your Leader was used as a source of inspiration for another angler - good job! Following that link will list all Recasts of your Leader Formula.